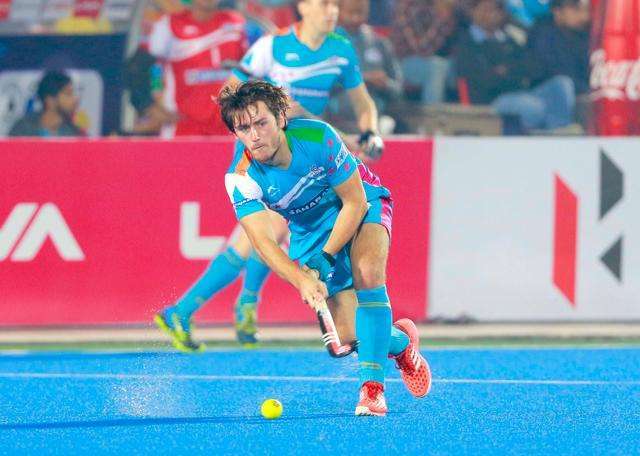 A 60th-minute goal by Gonzalo Peillat ensured the home team Uttar Pradesh Wizards drew with Kalinga Lancers 2-2, denting the visitors chance of climbing back on top of the points table in a thriller of a game here at the Hockey India League on Friday. It was a dramatic first quarter for the Uttar Pradesh Wizards, nudged by the support an energetic home crowd, got off to a rollicking start living up to the attack posed by Kalinga Lancers. Forward Akashdeep Singh, who has played a crucial role for Uttar Pradesh Wizards, showed class when he beat defender Amit Rohidas into the circle after a good assist by VR Raghunath to earn his team their first PC. However, the powerful drag flick by skipper Raghunath was brilliantly saved by goalkeeper Andrew Charter. But the Uttar Pradesh Wizards were quick to win another PC, thanks to good team work by Akashdeep and Ramandeep Singh in the 15th minute and this time Raghunath was impressive with an inch-perfect flick that landed in the top centre of the net like lighting. The 1-0 lead, however, lasted only a couple of seconds with the visitors winning their first PC with less than six seconds to go for the quarter to end. This time it was Arthur van Doren who was guilty of a foul that eventually saw the German Moritz Fuerste convert the goal to equalise. The visitors rallied back in the second quarter, getting off the blocks at a frenetic pace with their attack and it paid off with a PC earned in less than a minute into the quarter. PR Sreejesh, Uttar Pradesh Wizards’ experienced goalkeeper, dented Moritz plans of taking a lead as he padded the speeding ball of the German who took the flick again. Though the visitors won their third PC in this quarter, a miss-trap denied them yet another chance at taking the lead and ending the first half at 1-1. Kalinga Lancers have a reputation of being incredible finishers with as many as 15 out of the 18 goals they have scored coming in the second half of the game in this season. But the Uttar Pradesh Wizards did well with their defence to contain the visitors, not allowing them to take lead. Arthur van Doren was particularly impressive as he denied the visitors an opportunity to score a field goal on more than one occasion. It was a nerve-wracking final quarter, with both teams coming up with a thriller of a game. India’s No.1 goalkeeper Sreejesh continued to be impressive, keeping the Kalinga Lancers at bay. It was evident the home team was desperate for the winners’ points that would secure their semi-final spot as they were pushed to the bottom of the points table. But the Kalinga Lancers were resilient. Germany’s celebrated hockey star Moritz was incredible with his efforts when he converted a PC in the 51st minute after Lalit Upadhyay won his team this opportunity at taking a lead. The game got dramatic in the dying minute when a video referral was upheld for the Uttar Pradesh Wizards fetching them a PC. A perfect injection by Agustin Mazzilli saw his Argentine teammate Gonzalo Peillat convert the goal to hand a 2-2 draw sending the dug-out and the stadium into jubilation. Moritz Fuerste of Kalinga Lancers was awarded a prize money of Rs 50,000 for scoring the Coal India Goal of the Match from Mr A.K. Chakraborty, Director Technical CMPDIL. Ajay Yadav of Uttar Pradesh Wizards won the prize of Rs 25,000 for being the Hero Young Achiever of the Match from Mr. Dhanraj Pillay, Olympian. The Airtel Most Entertaining Player of the Match was awarded to Lalit Upadhyay of Kalinga Lancers that came with a prize money of Rs 25,000 and presented by Dr. R.P. Singh, Director Sports, Government of Uttar Pradesh. Moritz Fuerste of Kalinga Lancers was declared the Man of the Match and was awarded a prize money of Rs 50,000 by Mr. Abhijit Sarkar, Director, Uttar Pradesh Wizards.